I would love to be entered in your giveaway. I love tea cups and tea pots with roses. Thanks! I almost have my tea cup Tuesday ready - it is sad to see summer teas coming to an end - but we will have autumn teas and christmas teas. Both cups are beautiful. 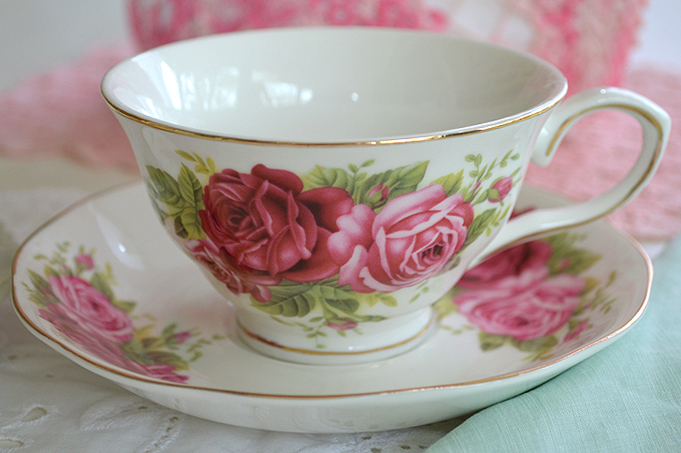 I love roses on teacups - the more I see them, the more I like them. So soft and sweet. 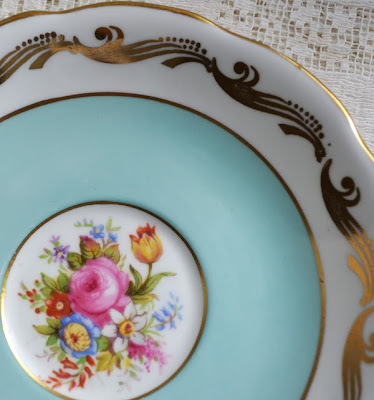 The EB Foley is so delicate with the gold and turquoise design with the flowered center. Your friends and you had a gorgeous day at the beach plus your photo is so beautiful! Have a great week! What a lovely cup. Thank you for the chance to win it. Love the aqua teacup, Terri! She's a beauty! You have a beautiful beach too, I see. So glad you got a nice day for it. Please enter me in your Giveaway and thank you. What a lovely teacup and beautiful color! I am enjoying the last days of summer and am not ready for fall! Thank you for hosting and have a great week! 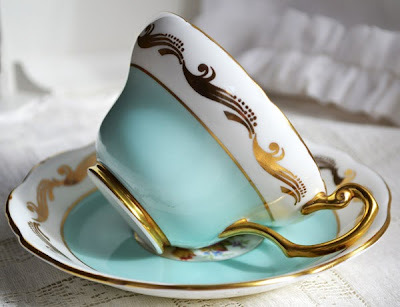 Truly one of the most beautiful teacups I have ever seen. Thank you for sharing. And that beach looks WONDERFUL!! 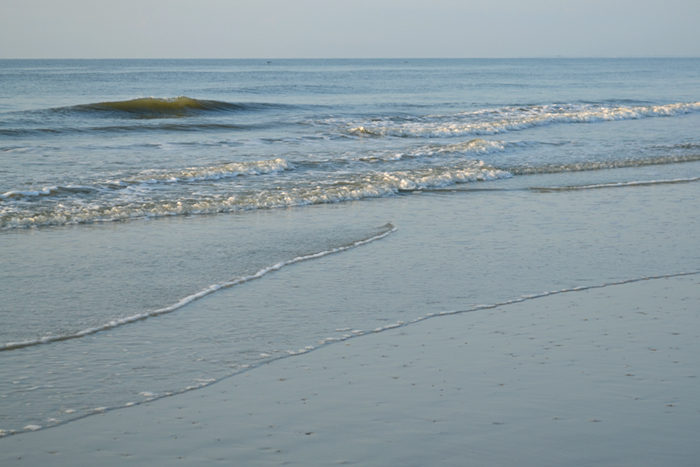 It's been almost a whole year since I have been to the ocean, and I miss water so! What a wonderful cup and saucer - you do have such pretty ones! We had rain all day - again and again so my tea tomorrow will be indoors too! This reminds me of my mom's garden, she had the pink and the red roses, (along with some yellow and a strange fluorecent orange-y color) but the pinks and reds were the most fragrant. I just love your turquoise teacup! It is absolutely gorgeous!Thank you for hosting with Martha! Have a wonderful week! Take care! I have just found your blog & have enjoyed looking at your pretty things. I collect mugs, but don't have a single teacup. I wonder if tea tastes "different" in a pretty cup? that tea cup is wonderful. The colors stay exactly for summer, sea and breeze. Love the little bouquet inside. Your giveaway is fabulous. Tahnk you for sharing that all and for hosting this sweet event. As to your tea cup choice for today's tea, it is another of those acqua beauties you seem to have the exclusive!!! Lovely, indeed, and with the golden waves so summer-like adding to its beauty. I'm glad I'm back to these delightful tea events. Thanks for hosting. Such a beautiful tribute to the last summer tea..how poetic my friend! Gorgeous blue cup..very peaceful and delicate...pretty florals within...wonderfully photographed as always..so lovely !And wowness such a beautiful giveaway...she is a beauty whoever wins her! Wishing you a last magical summer tea..and many autumn sparkles soon to be! J'aime beaucoup la tasse bleue avec les roses! What a beautiful choice of teacups. My grandmother collected teacups and so the really lovely ones always make me think of her. Bella taza para despedir el verano Terri. A mí me espera la primavera que ya se nota en sus perfumes, sobre todo porque tengo un jazmín en el jardin de casa. such beautiful teacups! I'd love to win the lovely roses cup and I know just what I'd do with it. Thanks for the generous giveaway! Thank you for the "pick me up" on Tuesdays!! What a pretty cup. Thank you for hosting! what a lovely tea cup and saucer. Please enter my name into your giveaway. I almost forgot to link! Love the aqua teacup Terri and the photo of the ocean looks so refreshing. We started out just above freezing this morning to a gloriously warm day of sunshine - perfect for gardening! 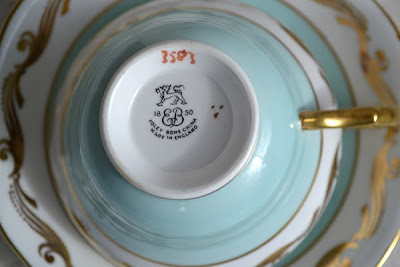 The teacup for the giveaway is pretty, please enter my name. That is such a beautiful tea-cup ! I love the aqua and the gold swirls. 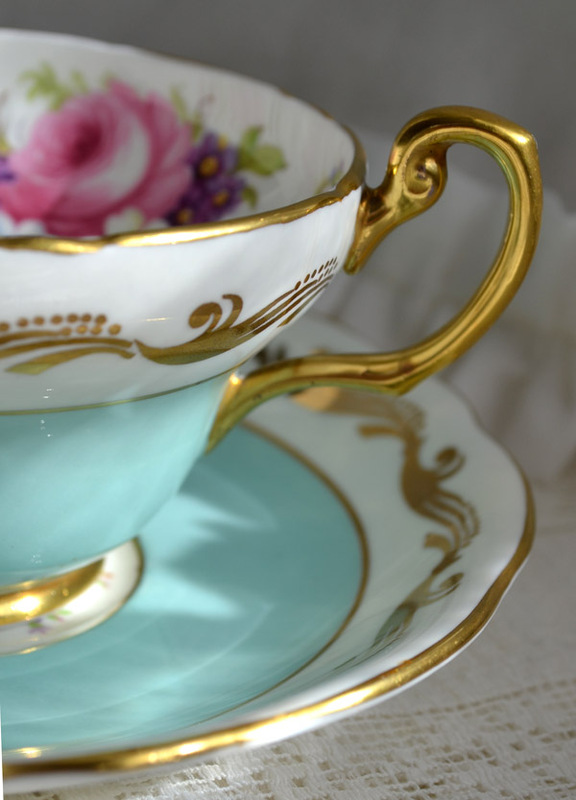 Please enter me in the give-away for the lovely teacup. Oh, you get to be at the beach. What a perfect way to end summer and glide into autumn. I always love seeing your amazing collection and that picture of the beach is dreamy! So glad you are having a great time with friends and relaxing! Hugs! I really need a good cup of tea and a stop in a cozy place. Such a beautiful, cup, it belongs near the fantastic sea shore you show here, --even have almost the same colour,- and the flowers are wonderful. Thank you for inviting to another give away, the cup is a such romantic and lovely win, for the lucky one. I hope you have wonderful dayes with your friends visiting, and sends you warm hugs. 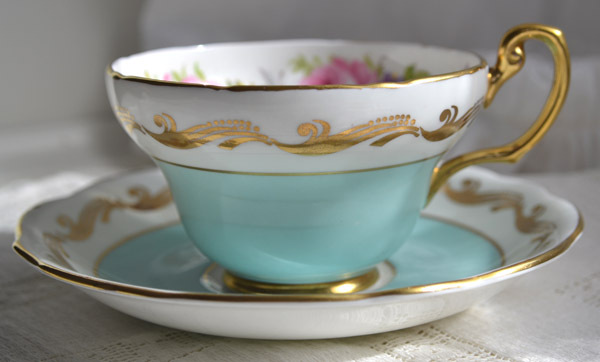 Both of your teacups are just beautiful, Terri. Glad you had time at the beach this summer with friends. Hi Terri, thank you for hosting this awesome tea party. I love all your te cups and please please can I be in the draw for that beautiful tea cup?? And oh how sweet of Martha for leaving that sweet message for you. You are two wonderful people. I enjoyed being part of your tea party. What a lovely give away. I love all your beautiful cups. So enter me in please. What a lovely give away. Love your blog and all the beautiful cups. I missed this post last Tuesday ... but it is not to late to tell you how much I love the color off the first teacup, and that I can nearly smell the roses of the second one... I would like to sign in , and if by chance I win it....I will make a nice cup of tea, and I will close my eyes and imagine I am drinking it with you!! Wishing you a wonderful week...looking forward to more of your tea post and creative posts too..
hugs and sparkles kindred, thanks for always adding a kind word to my day! Beautiful to revisit this post...stunning tea!